Will you help equip our new gym? 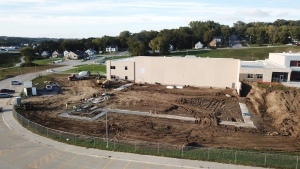 Our Heelan students continue to use "The Pit" while we build a new gymnasium onto our new high school to open August, 2019. Because of raising costs we are still seeking funds to equip the gym for athletics and a variety of other activities. You can make a difference. Learn more about our gymnasium needs by watching our video HERE. We are pleased to report that we raised nearly $20,000 in a one day giving blitz, "Siouxland Big Give," held Oct. 9. We are grateful to these donors and continue to raise funds to help equip the gym. To learn more contact Tom Betz at 712-226-0418 or email tom.betz@bishopheelan.org.